Now that I've been back at work about a month I feel like I am in a groove with pumping during the work day. 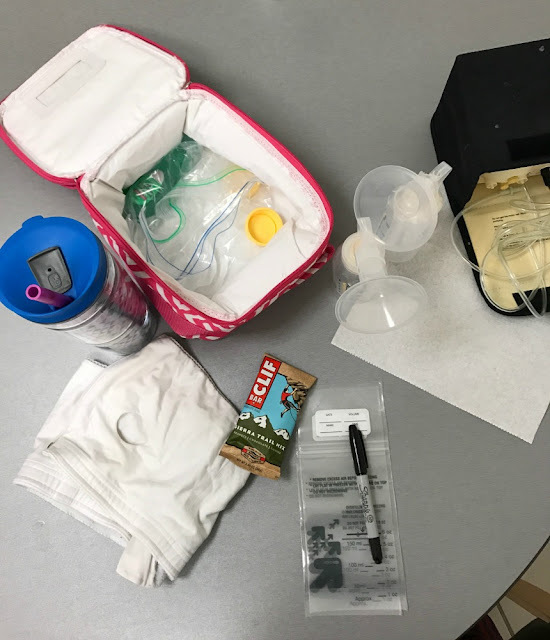 I talked about pumping at home here and here if you need a refresher. Or just contact me at any point in the day because generally I am either pumping, thinking about pumping or trying to eat and drink enough so I can pump later on. The long and the short of it is that pumping at work is a lot of work (setting up and repacking) but it is nice to have a break from my desk twice a day. If I could give any advice about pumping at work it is to make sure you are prepared in every facet. You essentially need to be a traveling pump gypsy with all of your things. Think through your day and your pumping process and triple check you have everything you need. 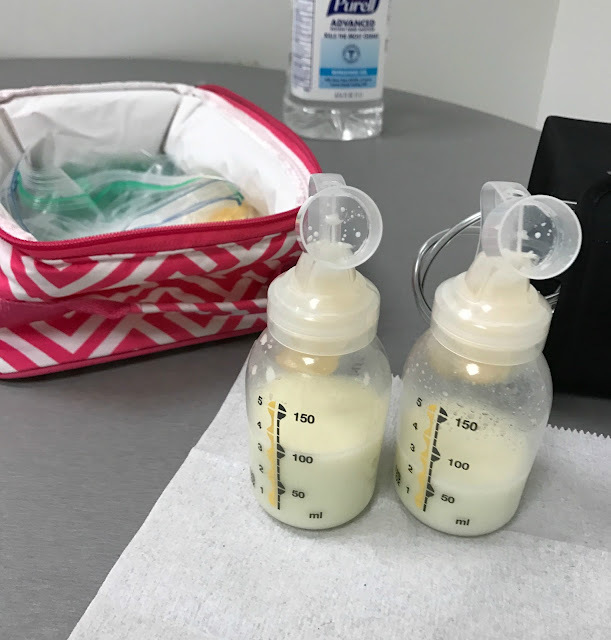 To make sure I was ready and felt prepared, I went ahead and purchased 2 of all of my pumping essentials (besides a pump) to make sure that I always have what I need with me at all times. The other key item is a bag to hold all of your things. 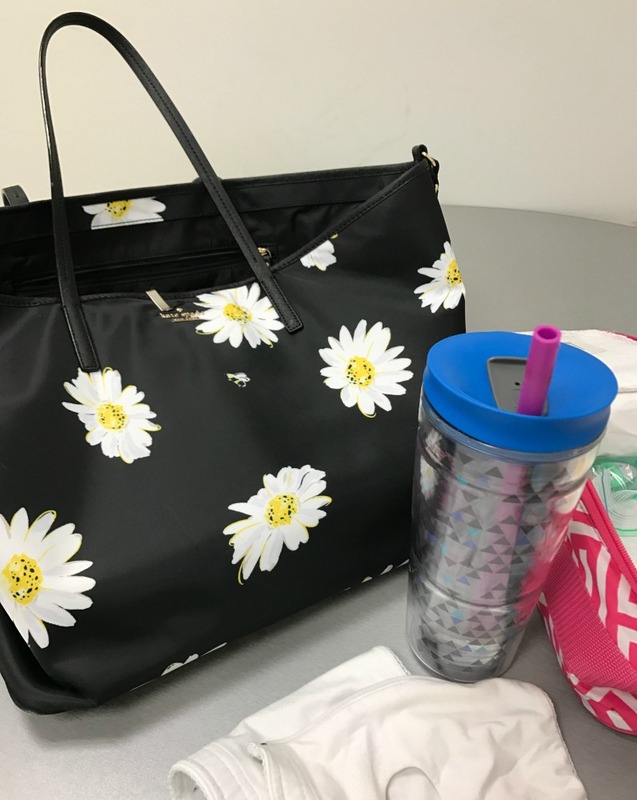 There are some really adorable pumping bags out there that hold your pump but I am actually just using a diaper bag we received as a gift. It's huge, doesn't look like a diaper bag and holds of my things, it's a winner. I then proceed to check about 9 times if I have everything. I try to get as much ready the night before as I can because I am pressed for time in the mornings and do not want to have to worry about it. I keep my parts in a lunchbox in the fridge and that has a dual purpose. 1- to keep the milk cold, of course and 2- so I don't have to wash my parts each time I pump. This saves a ton of time and sanity. Any questions or items I don't have in my bag that I should?? Pumping at work is definitely quite the challenge. I think it's underestimated how difficult it is to change gears from working mama to baby mama and back again a few times during the work day. I would maybe add medela quick wipes to your bag. I've had a flange touch a surface and I was already hooked up and didn't want to totally unhook, dress and use the sink to clean it up. The wipe was helpful for a quick clean in that instance. Also maybe a small pack of Clorox wipes to wipe the surface you are using (even though you have your paper towel). You never know what was there before you.